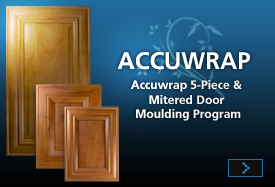 As a division of Accuwrap Profiled Components, Accucutt’s goal is to process your component part order requi rements. Our wood panel processing plant has been developed over the years to be a leading provider of top quality workmanship. Our technical expertise has allowed us to effectively ser vice industries ranging from RTA Furniture, Store Fixture, Kitchen & Bath, and Closet Storage. Using state-of-the-art equipment, Accucutt has become a leading complete panel processing facility driven by customer first service. Drilling, boring, Edging and Contour Edge banding, we provide every service required by a demanding and cost conches industry.